Ham and Bean Soup is made in a fraction of the time with the help of the pressure cooker! 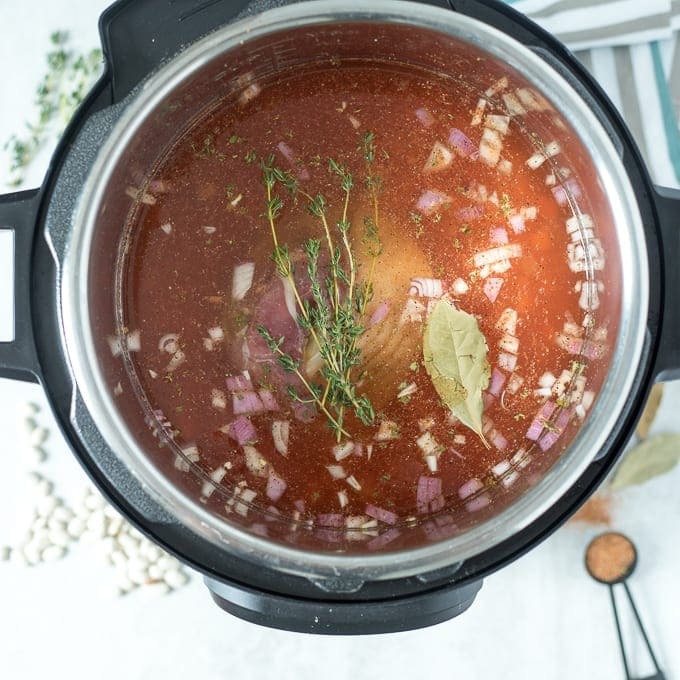 This Instant Pot Ham and Bean Soup is a delicious, easy, and hearty way to use a ham bone! Do you happen to have a leftover ham bone from Instant Pot Ham or Baked Ham? Use it to make this delicious Ham and Bean Soup. After every holiday, my mom or my grandpa would make a big batch of Ham and Bean soup from our leftover ham bone. And that is exactly what I do to this day with my leftover ham bone. Recently though, I have sped up the process of making this soup by using the pressure cooker. It is just as tasty as the original, but SO much faster. 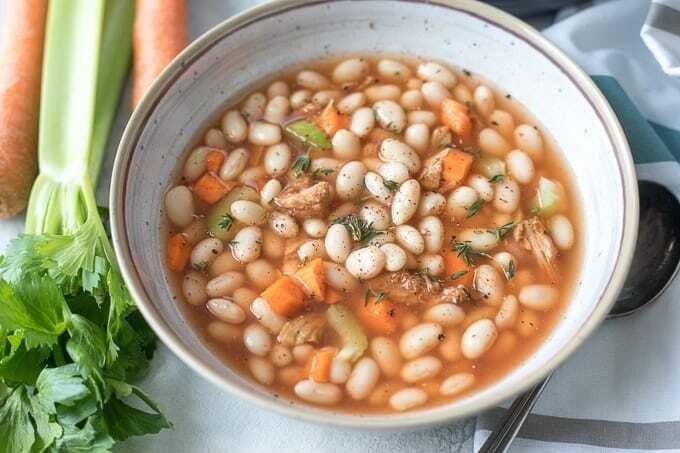 Tender white beans, and chunks of ham swimming in a rich, smoky broth–this Ham and Bean soup truly is comfort food. It also happens to be a super frugal meal. Dried beans and a leftover ham bone are the base to this soup. And those humble ingredients turn into something quite spectacular when married together with a few herbs and vegetables. Dried White Northern Beans–see notes below if using canned beans. Water–you can use chicken stock, but because ham bones can be very salty, depending on your stock, your soup may end up salty. If you do choose to use chicken stock, omit seasoned salt from recipe! Ham Bone/Ham Hock–a leftover ham bone is perfect for this soup, but you can purchase a smoked ham hock to make Ham and Bean soup as well. Tip: If using a bone from a Honey Baked Ham, be sure to remove any pieces of ham with glaze-or your soup will end up on the sweeter side. Celery, Onions, Carrots–This trinity of veggies is a classic base to most soup recipes. Feel free to omit one if you have picky eaters. And both red and yellow onions work! Bay Leaf–adds an herbal tone to this soup. Fresh Thyme–fresh thyme is best for Ham and Bean soup. In a pinch you can use 1 teaspoon dried thyme leaves. Garlic–freshly minced, jarred, or even 1 teaspoon dried garlic powder works. Omit if you do not like garlic. Seasoned Salt–a perfect blend of seasonings that adds just the right amount of flavor and salt to this soup recipe. Omit if using chicken stock or substitute kosher salt in seasoned salt’s place. 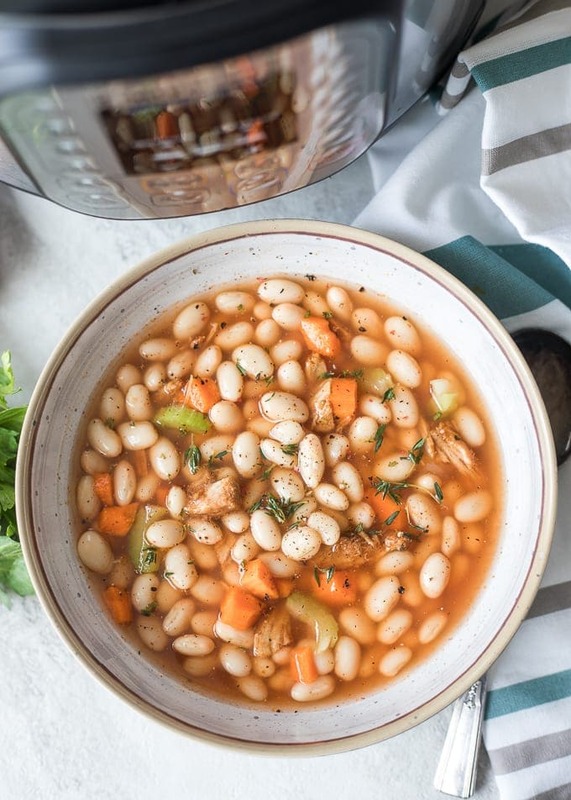 This ham and bean soup is as easy as placing all ingredients inside your inner pot of your pressure cooker and cooking–SUPER simple! Place all ingredients in pressure cooker. Place lid on pressure cooker and be sure vent knob is pointed to sealed. Set cook time by pressing pressure cook or manual (be sure pressure is set to HIGH) and use the +/- keys to adjust the time to 45 minutes. It will take 10-15 minute for pressure to be reached. Once cook time has elapsed, let pressure release naturally–resist the urge to do a quick release, as the instant pot is filled with starchy liquid that may spew all over your kitchen and you risk burning yourself. It usually takes 10-20 minutes for pressure to fully release. Remove and discard bay leaf and thyme sprigs. Remove ham bone/ham hock and if desired, pick off meat from ham bone and stir into soup. If you use soaked dried beans, decrease your cooking liquid to 5 cups and cook time to 35 minutes. If you use canned beans, decrease your cooking liquid to 4 cups and cook time to 20 minutes. To Freeze Ham and Bean Soup, cook as directed and let cool completely. Once cooled, place in 4-8 cup portions and place in freezer safe bags or freezer safe containers. Defrost slowly in fridge overnight and heat to serve. Add a bit more stock or water to thin out the soup if it seems thick. Rinse the dried beans, sort your beans to check for any rocks. Add water, ham bone, beans, celery, tomato sauce, bay leaf, garlic, thyme, seasoned salt and pepper to Instant Pot. Place lid on pressure cooker and turn vent knob to sealed. Set cook time to 60 minutes on HIGH pressure. (Hit manual/pressure cook button and then use +/- keys to adjust time to 45 minutes). After cook time has elapsed, let pressure release naturally. This can take 15-20 minutes. Open lid and remove ham bone, bay leaf, and thyme sprigs. Remove ham from bone and stir into soup. Oh this looks yummy! Definitely going into the dinner rotation! Thanks! I am always repurposing leftover ingredients, and this looks like such a tasty invention! THis sounds delicious and just perfect for soup season!